Today we’re continuing our series of AWR Cloud-oriented articles that will help you maximize the potential of your subscription. Even though – as some of you might remember – AWR Cloud started out as a reporting tool, it has evolved into a rankings monitoring tool we’re proud of today. And since we know many of you still prefer it because of its great reporting features, I thought I’d write a piece to tell you a bit more about the Whitelabel mode. The Whitelabel is a feature within AWR Cloud which allows you to hide any trace of our tool when sending reports to your clients. What’s more, you can customize it to such an extent that even users you invite to your Cloud account will think you’re working through your own in-house app. You’ll be the coolest SEO ever! The way you present yourself to your clients is one of the most important aspects of your success and credibility. Using the Whitelabel feature helps attest to your clients – who are often far removed from the process of SEO and rank tracking – that you do all the hard work. Moreover, it saves you the trouble of having to explain to clients what AWR Cloud is so they can remember and recognize it when it shows up in their inboxes. With Whitelabel set up, they see the emails as coming from you, from your company – and they don’t end up in the spam folder. This hero feature deserves a bit more attention, and I’m going to tell you all there is to know about it. Personalized Domain: team members and clients you work with will go to your domain to access the ranking data. 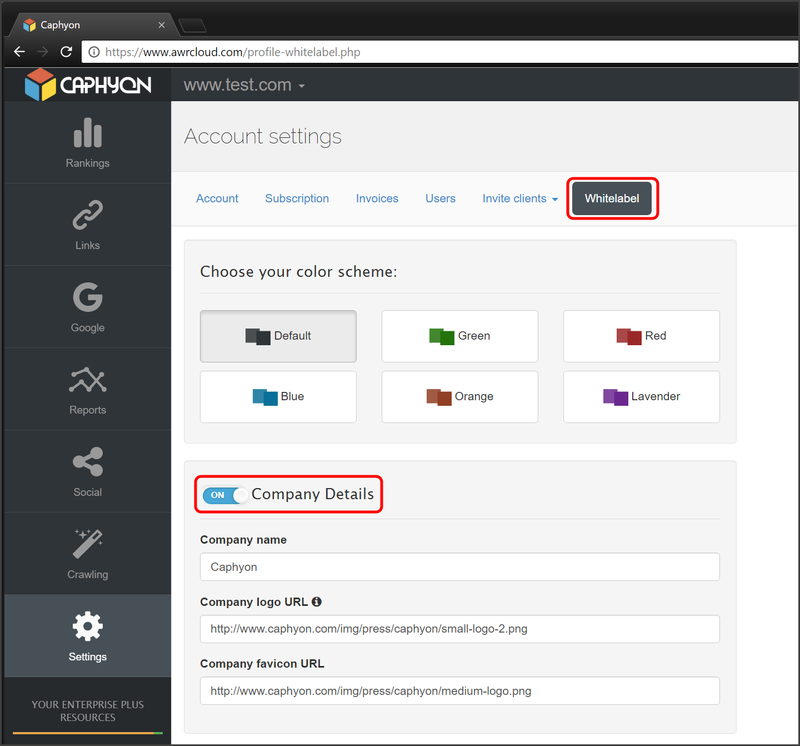 Personalized UI: use your own logo, favicon, and color theme. Personalized Reports and Email notifications: no trace of AWR in the reports and emails you send clients. Who can use the Whitelabel feature? The Whitelabel feature is available for all AWR Cloud users. It is also available for testing and exploration in the 30-day free trial, on all plans. So as long as you can set up all the requirements, you and your business can benefit from this feature which highlights the importance of your work and adds an essential finishing touch to your reports. Now let’s take a look at how to fully enable the whitelabel feature by changing your account settings. Log into your AWR Cloud account. Go to Settings in the left side menu. Click on the Whitelabel tab. At the left side of the [Company Details] box, you’ll see a toggle button that says “Off”. Click to turn the option On. You’ll see this option on the other two boxes in this tab as well – but only activate them if you want to fully enable the Whitelabel mode. Copy your company logo URL and paste it in the second field. Hitting the info button there will tell you the ideal size for logos (width: 200px & height: 40px). Copy your company favicon URL and paste it in the third field. This will appear up on the tab when you (or your clients/ colleagues/ shared users) open AWR Cloud in browser. Now all the reports will feature your own company logo, and you can stop at that if all you’re interested in is sending personally branded reports to your clients. Note: If you want to use the Whitelabel feature just for your reports, only turn on the Company Details box, fill in the fields, and save the settings at the bottom of the page. Another option for report-only whitelabel is to go to Reports -> Templates -> Brand. However, the sender email will still come from the awrcloud.com subdomain. If you want to hide any trace of AWR trademarks from your account, go through the following steps as well. The next box allows you to map a subdomain of your website to AWR Cloud, so that you can have your AWR Cloud account appear under your own domain. By enabling this feature, the reports you email to your clients will also appear as if hosted on your own domain instead of the default awrcloud.com. And when you or your invited members/clients log into the application, it will appear as if hosted privately. Turn it on, then type in your subdomain name as shown in the example there (eg. “seoreports.yourcompany.com”). Make sure you check out the Info box for clear instructions on how to properly set up a CNAME DNS record. Note: Keep in mind that you can only add one (company) domain for your Whitelabel settings. So if you have several, choose the one you really need for full Whitelabel reporting and sharing. Otherwise, you can use the Branded Reports template with different logos. 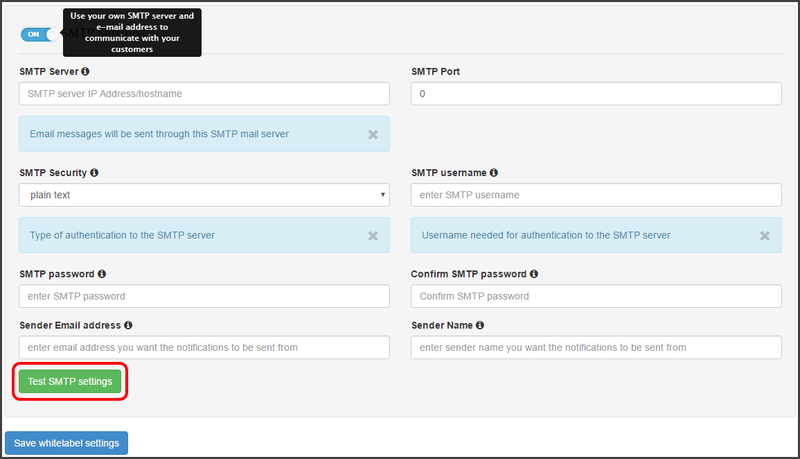 To configure this, you first need to type in your own SMTP mail server. If you’re less tech-savvy and don’t know what an SMTP is, or where to find yours, check out this article that lists all SMTP providers. Click the green button under the completed fields and test your SMTP configuration. A pop-up box will appear telling you whether the configuration was successful, and you’ll also receive an email confirming it. Finish by clicking the blue “Save Whitelabel settings” button. And what do you know, you’re ready to go! It’s as simple as that, yet so favorable to your business. Now all your notifications and reporting will be done with your company details. Just as AWR Cloud promised from the get-go, you and your associates and clients have beautiful, neat, and easy to understand SEO reporting. AWR Cloud allows you to create lovely reports that position you as an expert in your field and consolidate your image, and that you can refer to when developing your SEO strategy, or share with each of your clients. I’m really curious to know if you’ve used the Whitelabel mode before, and whether you prefer it for reporting, or generally. And how would you see the feature improved? Wow this is a great feature. I see it has a free trial of 30 days for all plans but what is the price after those 30 days? Which plan does one have to be on to keep using it? Hi Carissa, thanks for your comment! 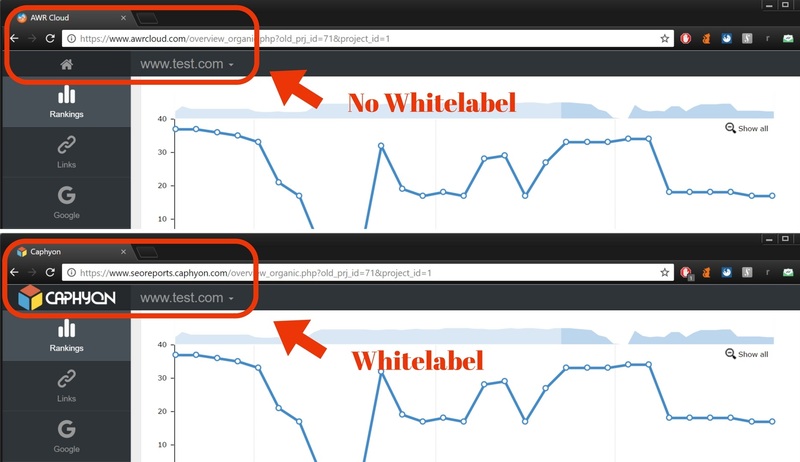 Yes, the Whitelabel feature is great for every type of SEO.